2014 Topps UFC Knockout returns to MMA collecting and looks to build on its immense popularity. Following a similar format as 2013 Topps UFC Knockout, each pack will feature an autograph or relic card. Full boxes include two autographs, two autographed relics and four relics. The base set in 2014 Topps UFC Knockout features 100 of the top MMA fighters. All base parallels are numbered and drop one per pack. The full parallel list includes Gold, Green (#/99), Red (#/8), Mat (1/1) - printed on mat stock, and Printing Plates (1/1). Autographs are a huge component of 2014 Topps UFC Knockout. Base Autographs note first-time signers with a "First Issue" designation. Parallels include Red (#/8), and Mat (1/1). Also, Red Ink parallels are numbered to 15 and some include the fighter's nickname. Other autograph options feature more than just a signature. Notable Nickname Autographs (#/25) include the unique moniker for each fighter. Ultimate Inscriptions Autographs adds an inscription and UFC @utographs (#/25) features the fighter's Twitter handle. Multi-signed cards also receive considerable focus. Three of a Kind Triple Autographs (#/10) include three fighters with a shared history. 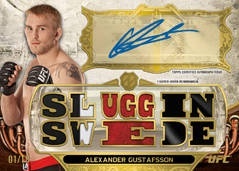 Sicksigs Autographs Books ups that total to six signatures and Memorable Match-Ups Dual Autograph Books include signatures from a pairing that has faced off in the octagon. Fight Mat Relics are the base memorabilia option and are numbered to 288. Parallels include Green (#/88), Red (#/8), and Mat (1/1). Other options include Knockout Relics, which are numbered and feature fighter-worn shirts or shorts. Memorable Match-Ups Dual Relics (#/50) include relics from previous combatants. 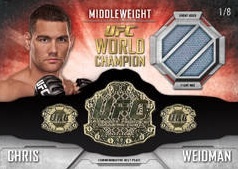 Champion Belt Plate Mat Relics pay homage to the nine 2013 UFC Champions with a replica championship belt plate and a piece of the octagon mat where they fought. Signed relic cards are also a prominent element found in 2014 Topps UFC Knockout. Knockout Autographed Relics cards are numbered and include a signature and a piece of fighter-worn gear. Other options include Dual Autographed Fight Relics (#/10), Memorable Match-Ups Dual Autographed Relics (#/5), and Championship Belt Plate Autographed Relics (#/8). Triple Threads Relics (#/36) are back and include three relics from one fighter on each card. Triple Threads Combo Relics (#/36) feature three fighter and three relics per card and Triple Threads Relic Double Combo Books (#/36) include six fighters and six relics per book card. All three include Amethyst (#/27), Emerald (#/18), Gold (#/9), Sapphire (#/3), and Onyx (1/1) parallels. Triple Threads Glove Patch Books (1/1) feature two fighter-worn glove swatches and a jumbo patch. Triple Threads Autograph Glove Swatch Books (1/1) add an autograph. Triple Threads Autographed Relics are numbered to 18 and feature a signature and three relics from one fighter. Parallels include Gold (#/9), Sapphire (#/3), Platinum (1/1), Leather (1/1) and four White Whale Printing Plates (1/1). Triple Threads Autograph Glove Swatch Books (1/1) round out the autogrpahed Triple Threads cards. A popular staple, Fist-ograph Box Toppers are back and numbered to ten. 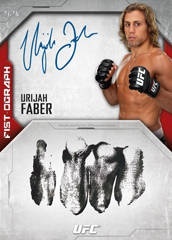 Collectors can also find rare Autographed Glove Redemption cards, which are good for a signed UFC glove. Topps 2014 UFC Knockout Red Ink Nickname Auto Josh "The Warmaster" Barnett 15! 2014 Topps UFC Knockout TJ Dillashaw (RUBY RED) 1ST AUTO CARD! (#6 8) WOW! 9 cards. Inserted 1:72 packs. 9 cards. Inserted 1:448 packs. 18 cards. Inserted 1:10 packs. 10 cards. Inserted 1:323 packs. 20 cards. Inserted 1:65 packs. 24 cards. Inserted 1:8 packs. 6 cards. Inserted 1:1,076 packs. 24 cards. Inserted 1:19 packs. 24 cards. Inserted 1:75 packs. 6 cards. Inserted 1:149 packs. 30 cards. Inserted 1:1,075 packs. 20 cards. Inserted 1:64 packs. Now that Topps is doing away with UFC Finest, this is the best UFC cards that you can get. No BS inserts to add fluff like the Bloodlines product. And best of all: 0 redemptions! At 3 base cards per minibox its hard to chase the base set. In 3 master boxes we got tons of doubles.